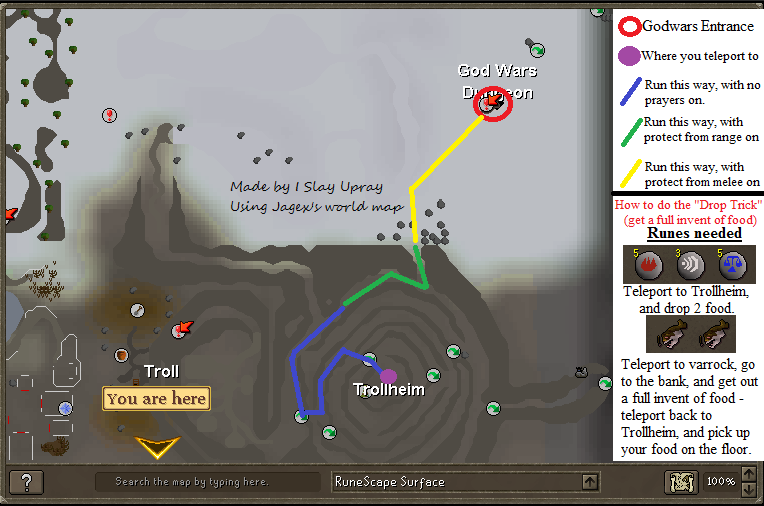 This guide was written by I Slay Upray to explain how to effectively dispose of the Zamorak boss, K’ril Tsutsaroth. This beastie is the strongest boss monster in the godwars dungeon, yet, with proper levels, gear, and knowledge, you can put him to shame over and over again! This boss, like most other bosses, requires knowledge, stats, gear, and has serveral attacks that he can deploy to try and extinguish your presence from his room – Firstly, the attacks! Regular melee attack – Hits only the Tanker, and can hit up to 400, but is harmless as Tanker uses protect from melee prayer to avoid any damage being done. Magic Attack – This attack can hit anyone, and can hit in the 200’s, but it is only harmful to the Tanker, as all the Attackers use the protect from magic prayer to avoid this. MELEE SPECIAL ATTACK – WATCH OUT FOR THIS! 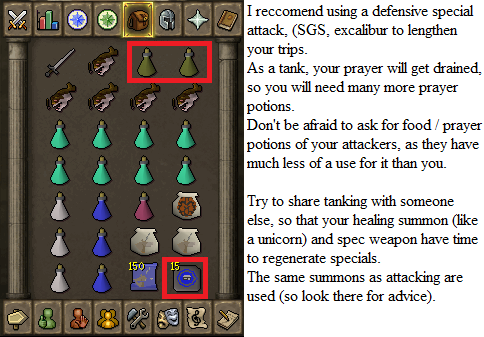 This special attack only hits the tanker, Hits through melee prayer, and can hit up to 500! Also, this drains the tankers prayer, so watch your prayer points when tanking! His three minions – These three other demons each attack with a different attack style (melee, range, mage), and may look as though they would make cute pets, but can hit a meaty 200+ each on any player! 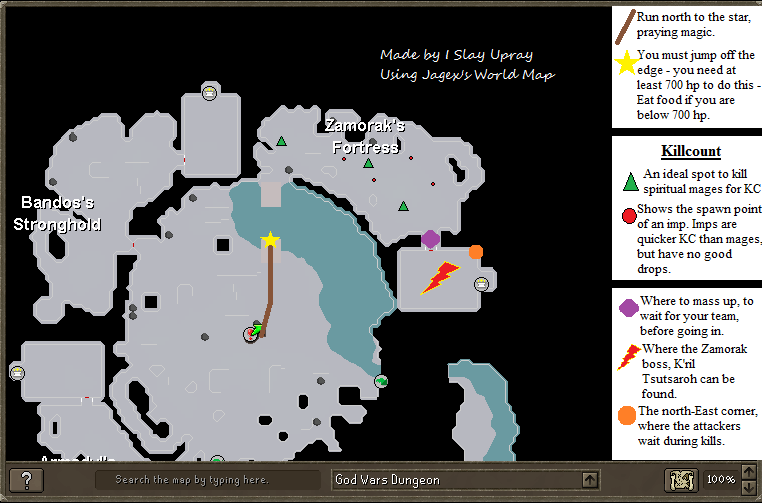 You may be wondering – So, how on earth do I get to the door of the fearsome K’ril Tsutsaroth? 80+ attack and strength – to be effective in damaging the boss. 70+ prayer – For piety – speedier kills. 70+ Defence + HP – less chance of death. *EDIT* For those without a unicorn, please remember your SUPER ANTIPOSIONS (ideally ++)!!! (they’re the browny pots in the picture) And if you are using a unicorn Solely to cure posion, you will need maybe 3-4 super restores as you need summoning points to cure poison. Bring 2-3 antiposions depending on how long you think you can last. 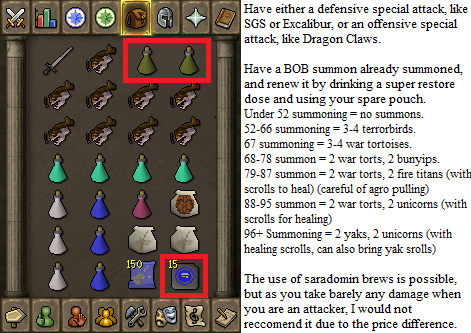 85 defence+hitpoints – increases survival chance + trip length. 80 magic – The big’un often likes to fire a bolt or two at you – helps to tank this off. 70 prayer, and the ability to notice when it is about to run out! Also, having decent offensive stats, like 80+ attack and stength, would be nice The quickprayers should be set on Protect item, Protect from melee, and piety. The tank should wait near the middle of the room inbetween kills and get the first hit onto K’ril to get his attention. 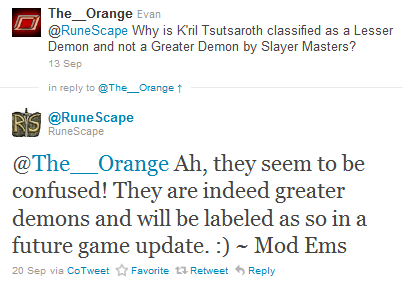 K’ril Tsutsaroth actually has a very low defense level for his combat level, meaning that it is easier to hit him than other bosses. However, he is very dangerous for the tanker, which makes up for this. The Darklight’s Special Attack is very useful when killing demons such as K’ril as it lowers their defense significantly. 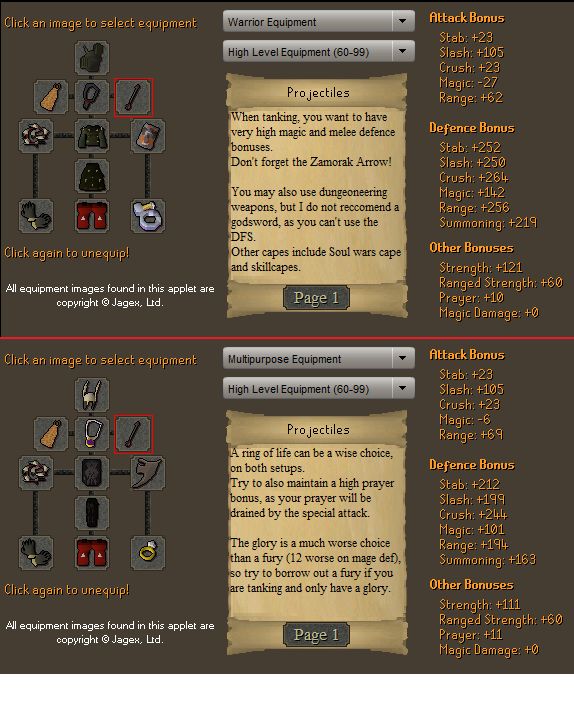 It is more effective than a Bandos Godsword special, and it can also be used twice in a row as it has a 50% drain. 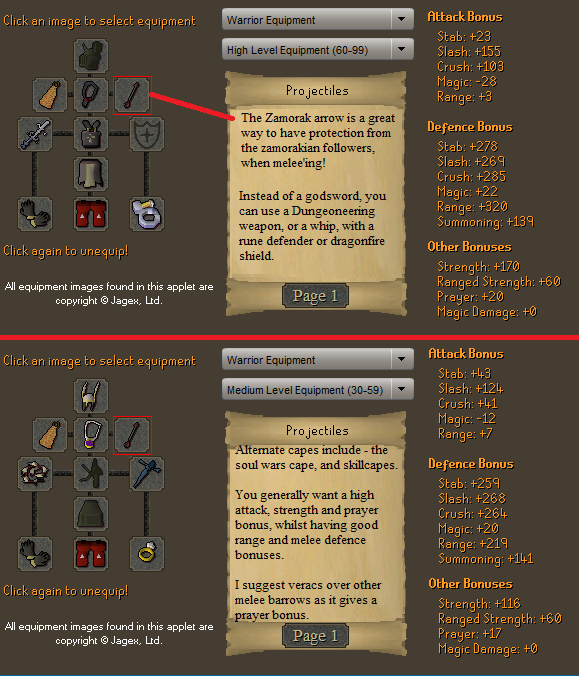 This makes it a very desirable choice for attackers, especially those that cannot afford Dragon Claws!